tattoos on your brain. : take you On a cruise. Whenever I take a train to Leiden, which is quite often lately, I always pass station Schiphol, Holland's major airport. The particular station is quite busy, but also has a very long platform on which the travelers are definitely not equally devided. When people are unloaded and loaded at Schiphol station, the train slowly picks up pace to continue to drive to Leiden. 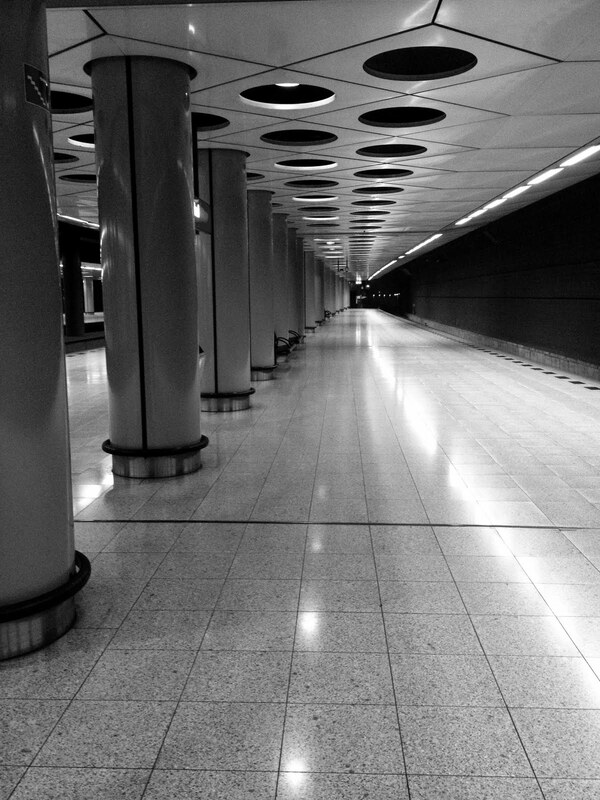 When that happens, you pass the ends of the platforms, which are empty and lonesome. Ever since the summer, this struck me and I have wanted to make a series of photographs of it, but never had the time to get out of the train to do it. However, some days ago I picked up my childhood buddy Maarten from the airport (he went to Uganda for 10 weeks) and I had plenty of time to spare, so I walked to the end of the platform and finally took some pictures of the deserted platforms. &Here are the results for you!